What is the image you see in your mind when you see that word? Is it a person buried under piles of paperwork at their desk? Or maybe it’s the vision of a face all twisted up with their hair tousled around as if they were about to pull it out? Maybe you envision yourself driving around from work to home, to errands, and back to work again. Regardless of the image you see, there is one thing we all have in common and that is desperately seeking the solution to manage stress. We all seek out the solution to stress looking for that magical answer. How many articles, presentations and books do you see on the topic of stress? Stress is an organisms response to a stressor such as an environmental condition or a stimulus. So to manage stress, you must have control. Control is the solution to stress management. Stress is a good thing. It triggers our fight or flight response. This is critical in a life threatening situation. But in our day-to-day lives, stress itself typically becomes a life threatening situation as it causes trauma to the body. This article is talking about how control can help us to avoid stress in our day-to-day lives. This helps with dealing with stress at work and at home. Scenario 1 – You have a presentation due for a meeting that’s starting in thirty minutes. You forgot about this presentation and now you have to think quickly and whip together the presentation in record time. Scenario 2 – You’ve just returned home from work and your daughter has dance class. You are rummaging through the refrigerator trying to figure out what to prepare for dinner. After dinner, you are looking through your daughter’s closet trying to find her dance shoes and you’re becoming frustrated and angry. You may even be quick tempered and become short with or yell at your daughter. Scenario 3 – You’re at work and a colleagues isn’t performing their part of the tasks on time causing your part of the work to be late. She also makes comments you find disrespectful to you in meetings. Overall, the two of you aren’t working well together and it’s causing you quite a bit of stress at work. You are irritated and frustrated and dread going to work each day. Can you relate to any of these scenarios? Do you experience something similar? All these scenarios can cause strong feelings, increasing the heart rate, knots in the stomach, feeling angry and very reactive in this situation right? In the first scenario, the first thing you can control is your response. Although you are in an intense situation, you can learn to control your breathing, take a few moments to calm the body and mind to reduce the impact of the stress on your body and your mood for the rest of the day. Another area you can control is not to forget about the presentation in the first place. Maybe learning better time management techniques will help you to avoid these situations in the first place. A control plan for your to-do list and work calendar can help avoid these situations. We will build a control plan in future blog posts. How about in Scenario 2? This scenario has two areas of control opportunities. The first is a control plan – meal planning and activities. Within these control plans, you build systems to know what’s planned for dinner ahead of time and have a designated location for dance shoes. The second area again is your response. Yelling at your daughter isn’t going to make this situation any better. In this blog we will share techniques to help in this area as well. In Scenario #3, you might feel there isn’t much you can do to control a co-worker. However, in this situation you still can control your response to the situation. You can also learn conflict resolution skills which might empower you to resolve this situation. Or if it fits, you can learn new skills and seek out a new opportunity removing you from this situation entirely. We’ll share more in this blog on both of these as well. If you implemented these ideas how much different do you think these situations would have made you feel or which situations may not have occurred at all? How different would your life be if you were able to gain control over these areas in your life? On this site, you are going to learn how to gain control. 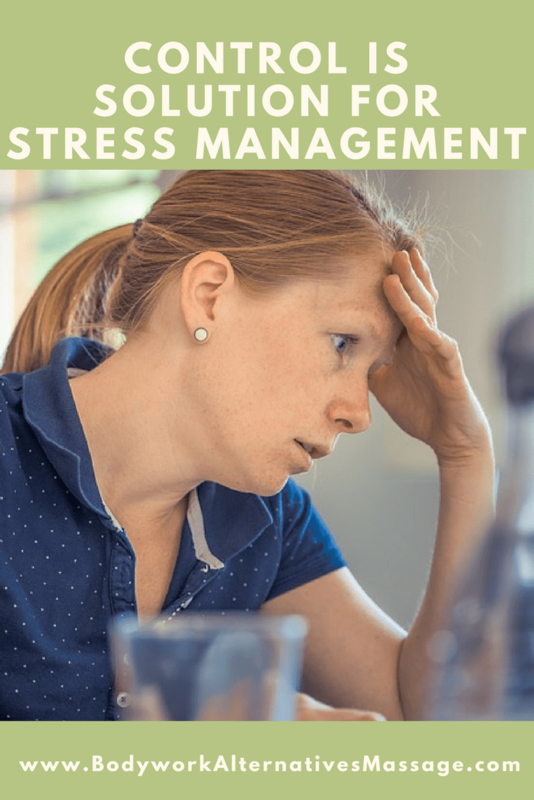 You’ll learn to develop control plans giving you time management techniques to deal with stress at work and at home. For now, take some time to look over the past week and identify the moments you were stressed. Ask yourself why you were stressed. Ask yourself why several times until you get to the root cause of the issue. Also, identify your response to these stressful situations. You’re looking for opportunities to improve your control in these situations as we did in the above situations. Where could you have had more control and been better prepared for the tasks at hand or where could you have been more in control of your response reducing the impact of the stress on your body?